Download my Barnard’s Star Observing guide in PDF Format. With printable star charts, so you too can keep track of its movement northwards. Barnard’s Star is the fastest moving star we know. Located in Ophiuchus, it is easily viewed in an 8 inch reflector, as a nine and half magnitude star. See my original observation here: Barnard’s Star Observation June 2012. 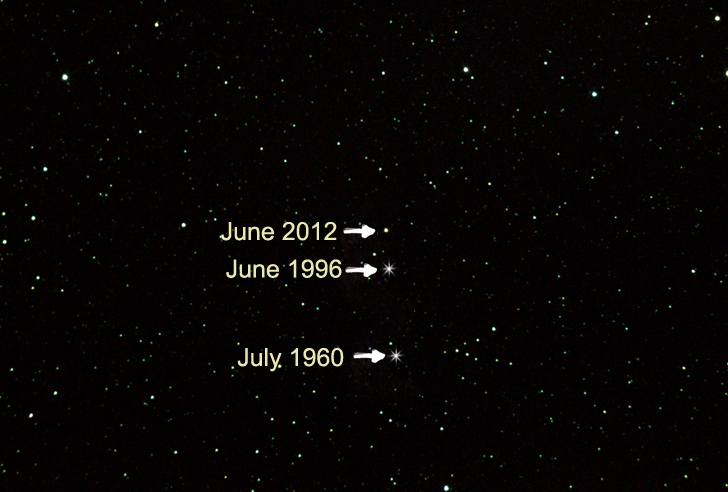 My image above shows the movement of the star over a number of years. Download my Barnard’s Star Observing guide, so you too can keep track of its movement northwards.